If your smile is missing some teeth, you probably want to get those teeth replaced. Tooth replacement is a safe and easy procedure that can be done with implants or dentures. In terms of investments, anytime you are caring for your teeth you’re doing yourself a great service. 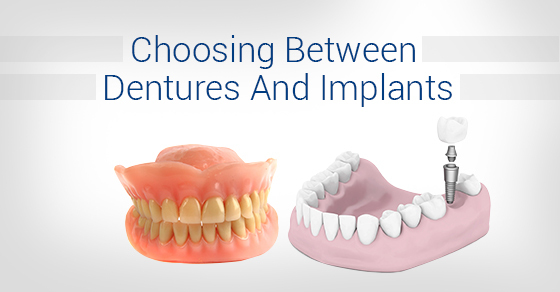 However, there are some differences between dentures and implants that may impact your decision as to which way to go to replace your missing teeth. When it comes to price, dentures win hands down. They are a more economical option and although they need to be replaced every 5-10 years (depending on your mouth), they will always be cheaper in the long run. Implants can last a lifetime but they cost more and there’s still a chance that they will need to be replaced if they’re not properly cared for. In terms of aesthetics, dental implants and dentures both look like regular teeth. Unless someone is sticking their face right up to your mouth to examine your teeth with a magnifying glass, no one will notice that you have replaced your natural teeth. In some cases, dentures and dental implants actually look better than natural teeth if your regular teeth have yellowed with age or lack of care. If you are only missing one tooth, then an implant is probably the better option for your mouth. If you are missing multiple teeth, dentures are going to be make more financial sense, and is the better solution for ensuring your remaining natural teeth don’t make future shifts in your mouth. With dentures and dental implants, chewing is, of course, possible. Although, you may need some practice chewing with your new teeth, you will be able to eat like you normally would in no time. If you already have an efficient oral care routine in place you will not notice the difference in caring for dentures vs implants. The great thing about dentures is that they can be removed which makes cleaning them a breeze. Whether you decide to get dental implants or a full set of dentures, tooth replacement plays an important part of dental health. If you are missing teeth and do not take care of them,you will become more susceptible to gum disease. By having implants or dentures put in, the surrounding teeth will not deteriorate and you will not experience problems with your jaw. When you do not fix missing teeth, you are making your jaw work extra hard since you are not using both sides of your mouth equally. Bottom line: Whatever your chosen course of action, always prioritize replacing missing teeth!